Mondays are always rough, but it's even more difficult to crawl out of bed and face a dreary Monday at work, after enjoying a four-day holiday weekend full of rest, relaxation and lots and lots of food. So what song will work best, to get us started on a day like today? I was thinking we'd sample from the stripped down rock of The White Stripes. A guy with a guitar, a girl with a kick drum; it's simple, pure, fun rock and roll. But what song? My favorite is "Seven Nation Army", while "Hardest Button to Button" has a nice little kick, but I think "My Doorbell" is the right fit for this morning. This song is an usual choice for me, because I am in love with Jack White's guitar, but this song doesn't showcase his guitar playing skills and is mostly piano driven. However, it never fails to make me smile. Not only is it a fun song, but the video showcases a whole audience full of adorable Rascal-esque kids. On an interesting side note, this song garnered The White Stripes a 2006 Grammy nomination for Best Pop Performance by a Duo or Group with Vocals. Enjoy! How come it's so easy to you? Hello, Loyal Readers, and welcome to the Monday of a short work week/school week. Yay! Here's a little music to get you moving. Flyleaf's long-awaited sophmore album, entitled Memento Mori, was released this month, and they did not disappoint. I must admit, I was concerned, because more often than not, when a band's debut album is super-successful (like Flyleaf's first album) they buckle under the pressure of living up to that standard when they make their second album. Luckily, that was not the case. In fact, I think they've really grown and this album is much richer and complex than their first album. Below is the first single, called "Again". If you like it, then I strongly recommend their other single, "Beautiful Bride." It rocks. I've always enjoyed video games. I've saved the world with Missle Command on my Atari system, twisted Greek mythology with Altered Beast on my brother's Sega, helped Mario jump through Super Mario Brothers on the Gameboy, screamed through Resident Evil on my brother's Playstation, stayed up until 3 AM playing Diablo with friends at a LAN party, laughed with Toe Jam & Earl III: Mission to Earth, shivered through Half Life, survived the quests in Fable and helped Ash save the world again in Evil Dead: A Fistful of Boomstick on our X-Box. Even now, I am addicted to the simple puzzle game Zombie Pizza on my iPhone. As much fun as all those games were, and as varied as they were in their technology, styles and challenges, I've never, ever, played anything like American McGee's Alice. 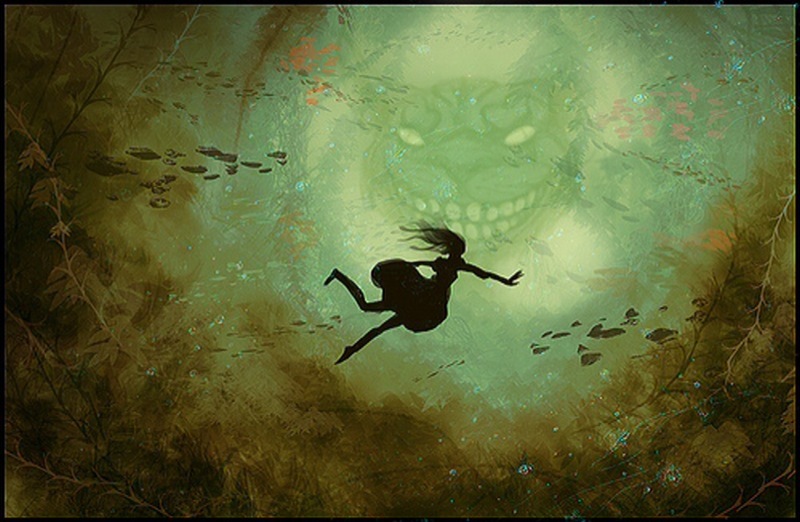 I'm a big fan of all things Alice in Wonderland, so of course I was already hooked by the idea of the game and I couldn't wait to get it home and try it out. I was pleasantly surprised at the terrific playability of the game and was immediately sucked in. It wasn't just a mindless shoot-'em-up. It Incorporated all the best parts of all the different game styles and all of these aspects were executed with superb quality. The story was rich, the puzzles were challenging and suspenseful, the first-person action was intense, and all of it was laced together with dark humor, gorgeous art direction and some of the most beautifully haunting music (scored by Chris Vrenna, former drummer for Nine Inch Nails). This game had it all. And the individual challenges, levels, puzzles, etc. all contributed to the story and led to an ultimate and satisfying goal. 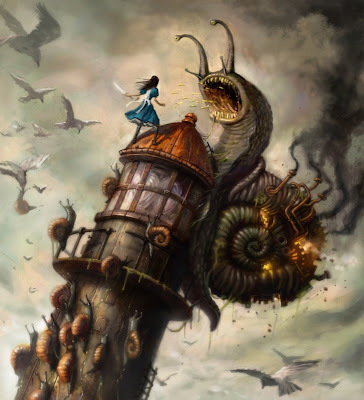 Game designer, American McGee, certainly knew what he was doing. He created a world that I thoroughly enjoyed visiting. Please leave me a comment about your favorite video game when you were growing up, or that you're playing right now. Know of any good iPhone games? I love 30 Seconds to Mars and I practically wore out their last CD, A Beautiful Lie, which was released in 2005. So I was very excited to finally hear new music from them. 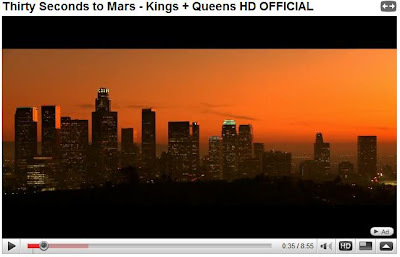 This is the song "Kings & Queens" from their new album This Is War, which is being released on December 8th. Jared Leto might be an eccentric and bizarre actor, but boy can he sing! You Tube won't let me embed the video, so just click on the picture below and it will launch the You Tube video in a new window. If you like this song, why not check out their video for A Beautiful Lie, The Kill (the video is an homage to The Shinning), or From Yesterday. All their videos are very cinematic. My Chemical Romance is probably one of my all-time favorite bands. There. I've said it. For those of you who aren't in the know... My Chemical Romance (a.k.a. MCR) is an American rock band, which formed in New Jersey in 2001, one week after the September 11th attacks. The lead singer, Gerard Way, was working in New York and saw the planes crash into the towers. This prompted him to re-evaluate his life and he decided not to waste anymore time, but to go ahead and chase his dreams of having a band. He's also said that he wanted to make a positive difference in people's lives through music. Their music has been described as alternative rock, pop punk, and emo (which it is most definitely not), but I think it's just good straight-up rock and roll. I'd always intended to include MCR on one of my "Musical Interlude" Monday posts, I just didn't think it would be this song. I was going to post a different song, but when "I'm Not Okay (I Promise)" came up on my random playlist on my iPhone this morning, it was the right fit. This is not the first MCR song I heard that made me fall in love with them (that would be "Helena"). It's not even the best song in their portfolio (although it was their first single and it did receive a lot of radio play), but what it is, simply, is a good fast song to wake you up and get your blood moving first thing on a Monday morning. The song is a somewhat tongue-in-cheek break-up song, about the frustration with a relationship that just didn't work. I also think it's a humorous response to one of those situations where someone breaks your heart or you've just been hurt really bad for some reason, then the person has the gall to ask if you're going to be okay, and most of the time, we answer, "Yeah, I'll be okay," to dimsiss them and let them off the hook, or to save face. This song starts out by saying, "If you want me to be honest, that's all you had to say, and no, in fact, I am NOT okay." If nothing else, the video is clever. It's filmed like a trailer for a movie, and references a lot of the high school movie cliches, about being social outcasts. I especially like the little references to Heathers (one of my favorite movies) and I love the final joke at the end. I hope you enjoy it, but if not, that's okay. Variety of opinions and artistic expressions are part of what makes the world more interesting! it's better off this way. but the pages all are torn and frayed.